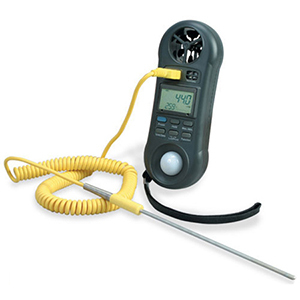 The HHF81 anemometer can measure air flow, humidity, temperature and light. The built-in microprocessor circuit assures excellent performance and accuracy. The HHF81 can track the maximum and minimum values along with current readings. The HHF81 displays the flowrate in your choice of knots, meters per second, kilometers per hour, miles per hour, or feet per minute. The HHF81 relies upon a low-friction ball bearing mounted wheel design to provide high accuracy at high and low air velocity. The impeller provides excellent accuracy (±3 to 4%) and the ability to measure the slightest breeze (0.3 m/s). For temperature readings, the HHF81 has an internal thermistor or is compatible with any Type K thermocouple with SMP Male connector, and is accurate to ±1°C + 1% of reading. The humidity sensor measures to 95% relative using a high precision thin-film capacitance sensor with fast response to humidity changes. The Light measurement utilizes an exclusive photo diode and color correction filter light sensor. 참고: Comes complete with operators manual and 9 V battery.